With the beginning of Autumn, the changing of the leaves and the cooler temperatures, we start to look forward to the Holiday Season. Images of Family gatherings, children playing outside, and of course the traditional Holiday meal fill or mind! I grew up in Kent, England and now live in Atlanta, Georgia with my husband & his family, as well as my own extended family. When families grow thru marriage & friend, we bring our favorite special dishes to share, and thus our family traditions and favorites grew and change. Today I made my wonderful mother-in-law a traditional English Trifle for a party she is attending. It’s not quite the holiday season, but I when I heard she was to take a dessert I offered to make one for her. I decided to make one that has been a family favorite for years. It has always been enjoyed at parties, at Christmas time & now enjoyed by my new family. So, if this holiday season you find yourself looking for an easy, delicious & pretty dessert to share with friends & family, enjoy a Traditional English Trifle. 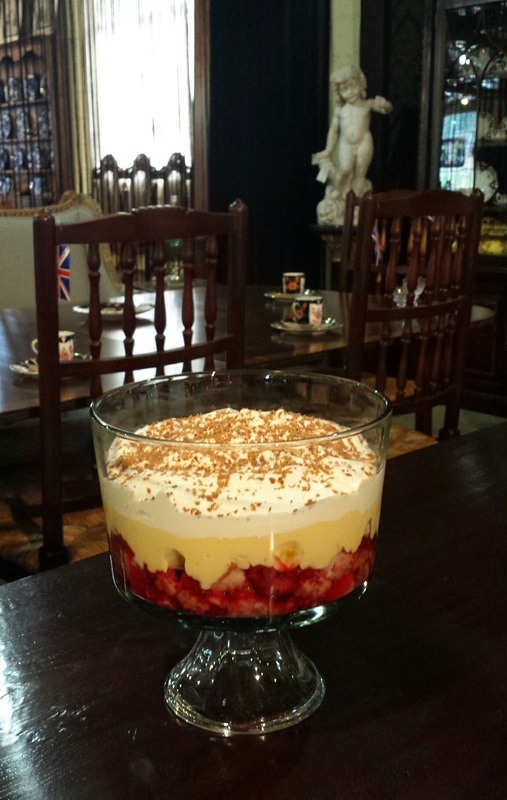 I like to use a glass dish for my trifle as it does look very pretty. Thinly slice the Angel food cake & spread with raspberry jam. Cut into bite size pieces and place in dish. Pour over sherry and stir allowing the cake to absorb all the liquid. Place the raspberries & juice over the cake. Scatter the sliced bananas over the raspberries. Enjoy & I hope this makes you reflect on family favorite foods & time spent together. Next > Something is Missing.